It’s strange to look up at the East Tower and see that the familiar yellow exterior is slowly disappearing. The attention-grabbing color helped to signal the new hospital building‘s presence and call attention to its unique design. I recently asked one of the construction guys to explain to me what was happening. I saw that some of the exterior walls were black, some were brown and others white. Not surprising, the answer wasn’t as quick and easy as I’d hoped. First, I needed to familiarize myself with some basic design components specific to our project. For instance, while we have always referred to the top five floors of the East Tower as the butterfly, I didn’t know that the base was referred to as the podium. The butterfly will house the acute and critical care patient rooms. And the podium will be the home of the emergency department, the interventional platform, noninvasive imaging, women’s services and the NICU. Next, I learned about the two types of exterior wall systems – the curtain wall and window wall. The curtain wall is a continuous wall of windows and can be found on portions of the podium. The glass panels were specially designed and will help bring natural lighting to many areas of the new hospital. 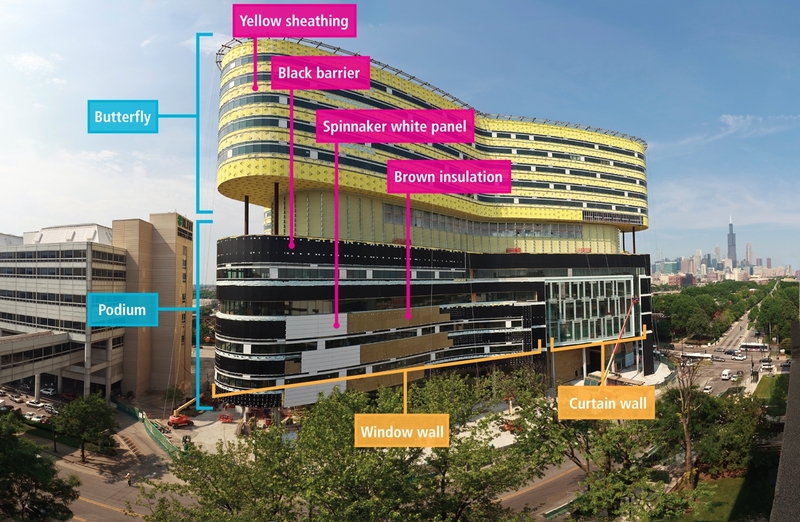 The window wall (home to the famous yellow panels) is a four-layer system designed to protect the air quality and healthy internal environment. These layers work together to assure the hospital is air- and water-tight and able to withstand heavy winds and severe weather. Yellow sheathing – These 7- by 14-foot yellow panels form the framework for the next three layers. Black barrier – An air and vapor barrier comprised of two components: a waterproofing sheet that is used to cover any crevices, floor joists or other joints where air or water could penetrate; followed by a black, tarlike substance is added that creates a solid barrier to prevent air, water or moisture to permeate through the wall. The substance is flexible as well to accommodate the building’s subtle movements during high winds and inclement weather. Brown insulation – Next, a three-inch insulation layer is attached to helps maintain ideal temperatures inside the hospital. Spinnaker white panel – The final layer is an aluminum panel that does double duty, serving as a water screen for the insulation and providing the aesthetics for the building – a white exterior facade that will be complemented by pewter-colored columns. The exterior wall systems should be completed on schedule by the fall. This entry was posted in Rush Transformation and tagged east tower, new rush hospital, Rush Transformation. Bookmark the permalink.